The quadriceps muscle group is the most common site for extremity soft-tissue sarcomas. The most common sarcomas at this site are liposarcomas, malignant fibrohistiocytomas, and leiomyosarcomas. Although tumors of the anterior thigh can be extremely large prior to diagnosis, approximately 95% of these lesions may be resected. Today, resections of the anterior thigh compartment are extremely safe and reliable, and the reconstructions produce good functional results. The quadriceps group consists of four muscles, only a portion of which may be required to be resected. 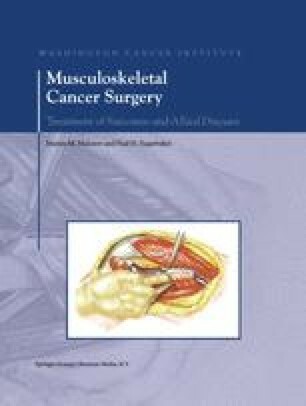 When resection of the entire quadriceps muscle group is required, the defect may be reconstructed by centralization of the biceps femoris and sartorius muscles. Careful preoperative evaluation of the femoral triangle, inguinal ligament, groin, superficial femoral artery, and underlying femur is essential to surgery. There are several treatment strategies for high-grade soft-tissue sarcomas. We prefer induction chemotherapy followed by resection. Postoperative radiation therapy is utilized only if there is less than 90% tumor necrosis or a close surgical margin. The most common indications for amputation (i.e. modified hemipelvectomy) are large tumors with extracompartmental extension into the adductor and hamstring musculature; tumors with intrapelvic extension through the femoral triangle and inguinal ligament; large fungating tumors; and massive contamination, with or without infection.